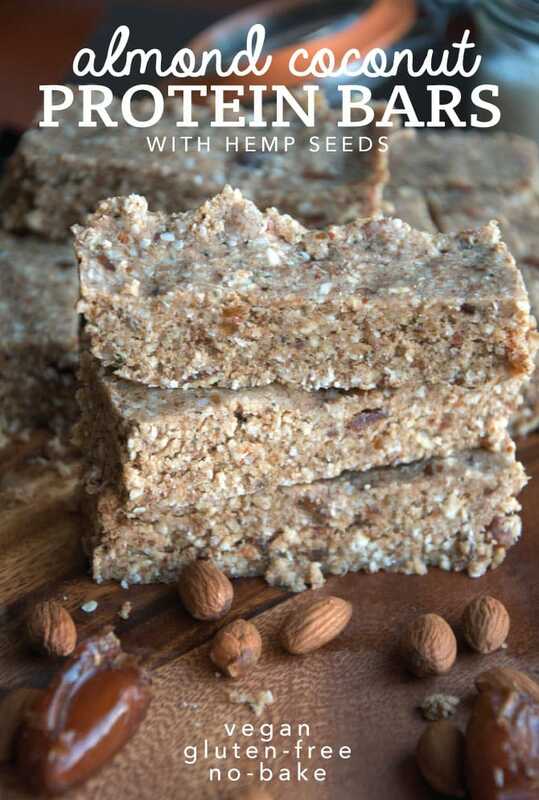 These Almond Coconut Protein Bars with Hemp Seeds are just asking to fuel your busiest, active days! They’re perfect as a pre-workout snack, great for powering a long run or hike or even as a quick breakfast on-the-go. Plus they’re so delicious, you’ll be looking forward to enjoying one, every single time! They make a great alternative to store-bought protein bars, so skip the hefty price tag and scary list of questionable ingredients and give these homemade coconut protein bars a try! 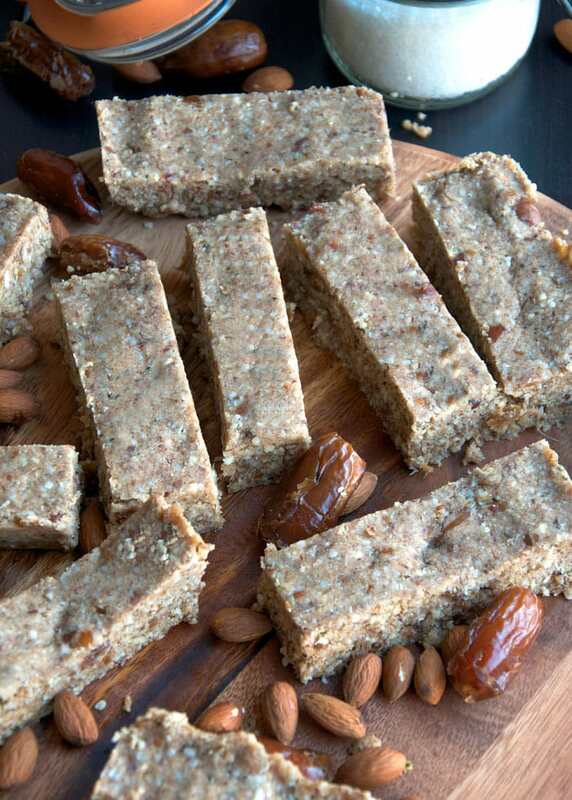 These protein bars are super easy to make. Just mix it all up, press into a lined pan, set, cut and enjoy! No baking required. I think I take for granted understanding how easy plant-based eating is. I forget that for those not familiar eating vegan diet, it can all seem very overwhelming. BUT, trust me, it’s so much easier than you think! People have asked me “but, what do you eat? ?” or made comments like “but, isn’t it so hard and expensive?” The thing is, that couldn’t be farther from the truth! Without meat, dairy and eggs to buy, vegan grocery shopping is very inexpensive and with a little prep and planning, it’s easy as can be, and most importantly, there is so much to eat! Don’t think of vegan food as “vegan food,” it’s just food! 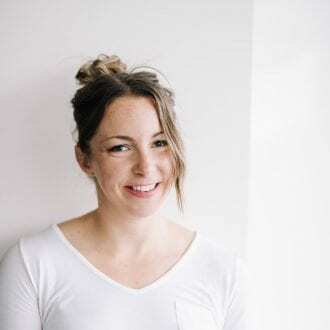 And with the vast amount of resources and grocery items available today, it’s never been easier to throughly enjoy and thrive on a plant-based diet. I think hemp seeds are my all-time favourite super food. They’re very low in sugars yet high in protein and omega-3 essential fatty acids. They’re rich in vitamin E, fibre and a range of other antioxidants, vitamins and minerals. Plus they’re a complete source of protein, a rarity in plant foods. Raw hemp seeds offer a wide range of health benefits from improved energy, faster recovery, lowering cholesterol and blood pressure, reducing inflammation and improving circulation, among other things. I eat hemp seeds daily as a source of energy, protein and omega-3 fatty acids. I like to add them to smoothie bowls, sprinkle them on coconut yogurt or my overnight oats and add them to salads. 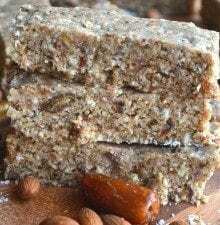 They’re also a fantastic addition to homemade energy balls and bars just like these almond coconut protein bars. For a healthy, pre-workout snack, try eating 1/2 to 1 of these bars about 30 minutes to an hour before your workout. The dates, hemp seeds and coconut make them great pre-workout thanks to healthy fats and carbohydrates. They would also be suitable to enjoy after your workout thanks to the added protein powder. Aside from the Vega protein, the hemp seeds and almonds also provide a nice boost of of protein. 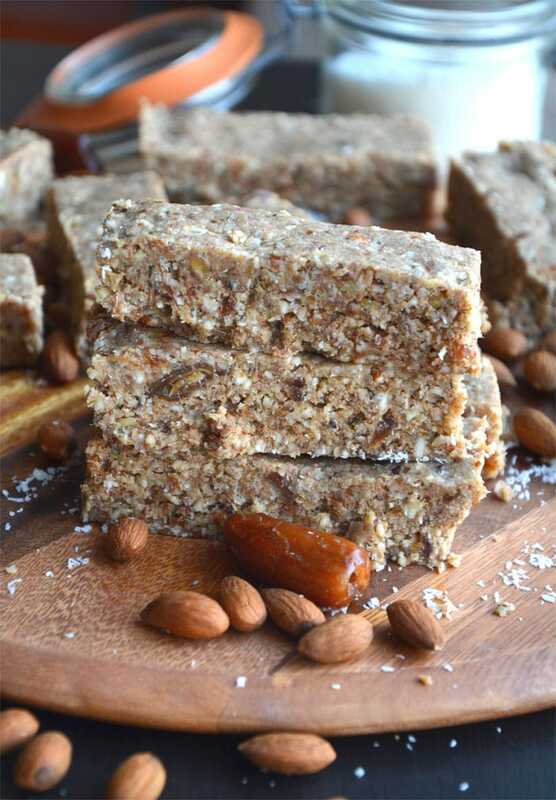 These bars feature some of my favourite whole food ingredients: coconut, almonds, hemp seeds and sweet, soft, energizing dates. Make sure you’re using fresh, soft dates for best results. I recommend using medjool dates if you can get your hands on some, if no, neglect dates are also a good choice. If you can only find dates that are dry, soak them in hot water for 15 minutes and drain before using. To make these bars, you’ll need a food processor or high-speed blender. I used my Ninja blender to make them. You’ll need to blend up the “dough” before pressing them into a baking pan and letting them set in the fridge or freezer. You’ll also need some parchment paper or saran wrap to line the pan. By lining the pan with parchment paper, it makes lifting the finished product out the pan to cut into bars as easy as can be. Place the almonds in a food processor or high-powered blender and mix until broken down. Add the dates and hemp seeds and mix until it forms a dough. Remove and place in a large bowl. Add the rest of the ingredients to the bowl. Use clean hands to thoroughly mix it all together very well. Press the dough into a parchment paper-lined (or wax or saran) square baking pan. Spend some time thoroughly pressing it in to the pan to ensure a bar that holds together well. Lift out of the pan and cut into 12 bars. You must have been in my head tonight girl! I was just wondering how protein powder would act in a date based bar! So glad it works 🙂 I’ll be trying this soon for sure! Love the added coconut – it’s one of my favorite flavors! I’m all about hemp seeds lately and I’m always looking for a good pre-workout snack! These look perfect!! I definitely need to try these bars – they sound amazing!! I never make my own protein bars, but I should totally give it a shot. Thanks for the recipe! These look so good!! I never used dates before. I’ve seen them n so many recipes but always feel nervous trying them. I’m a huge hemp seed fan so these definitely need to happen! Thanks for this! Can you use chia seeds in place of hemp seeds? If so how much? I can’t find hemp seeds at my store so wanted an alternative. Also I’m assuming you can substitute almond butter for ground almonds but not sure how much? My almond butter just has almonds as ingredient. You won’t be able to use almond butter unfortunately since you need the ground almonds to be dry, they aren’t ground up as far as almond butter. You may be able to replace with oats or another ground nut or flour of choice. Chia seeds should be okay in place of hemp seeds but I can’t guarantee they’ll work as well. Thanks! Do you have the actual nutritional content..like calories ..fat.. carbs ..and actual gr protein..etc? Or did I miss it somewhere? This information I need . Thanks. Sorry, Linda. I don’t have the nutritional information. You can add the ingredients into an app like My Fitness Pal or My Net Diary though and you’ll be able to get the nutritional info/serving. Thanks for checking out my blog! these bars are great! I add flax seeds to mine too. Do you use a food processor or a blender? The dates get stuck I my Vitamix and I’m trying to figure out a way to prevent them from getting stuck so I don’t burn it out. I have tried several of the Axe recipes for diabetes & they’re all good…will definitely do this one (I already know it’ll be amazing, just by the ingredients)! Will be a great snack as I continue to compile a book for diabetics! I LOVE these bars. So much better than anything I’ve ever gotten from the store and ridiculously easy to make. Thank you for the recipe! Thank you for adding that in!! my husband had a heart attack and we are eating very low carb for heart health. we are always looking for new ideas and these bars look like a great breakfast option. Can you suggest a way to make them “less carbs” … would i cut down on the amount of dates maybe or would that compromise the texture ? In these ones you’ll need the dates to hold them together, I can’t really recommend a way to reduce the carbs in this recipe. Raisins or figs could be used to replace dates but they’d be similar in carbohydrates to the dates. These sound amazing but is there a substitute for the coconut oil??? Thanks! The coconut oil helps to hold these bars together and I haven’t tried this recipe without the oil, I can’t recommend any subs for it that would produce the same result. I may update it soon though as my nutritional preferences have changed since creating this recipe. I’ll let you know! Looking at these figures, looks like protein ranks last leading me to feel like calling these “protein” bars might be a bit of a misnomer. I think “Energy” bars might be more accurate. That being said, these are really easy to make and taste pretty good so thanks again. Thanks for calculating that, Max. I think 10 grams of protein is pretty good but ya, more of an energy bar than a protein bar! I’ll probably update this recipe soon since it’s quite an old one. Still yummy though!! Where would I find the nutrition info? I don’t have the nutritional info calculated for this recipe. You’d have to enter it into MyFitnessPal or another nutritional info calculator to figure it out. Thanks! Delicious bars Deryn. Thank you for sharing your recipe. I made these yesterday and they turned out very tasty. I had a question; how long will these keep in the refrigerator, do you think? They should be fine for a week or so, you can also store them in the freezer for up to 3 months. They’re actually really good straight from the freezer!